With 200g on the drive bogie and a large can motor, Bachmann's 108 has a wild excess of drawbar pull and power. Considering that the same drive arrangement will be used in the forthcoming 4-CEP, Bachmann's approach is to an extent understandable. 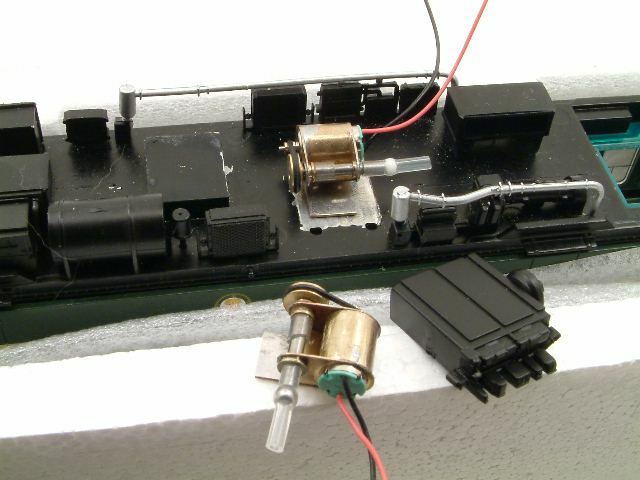 This page describes an alternative approach with small motors and sprung bogies. 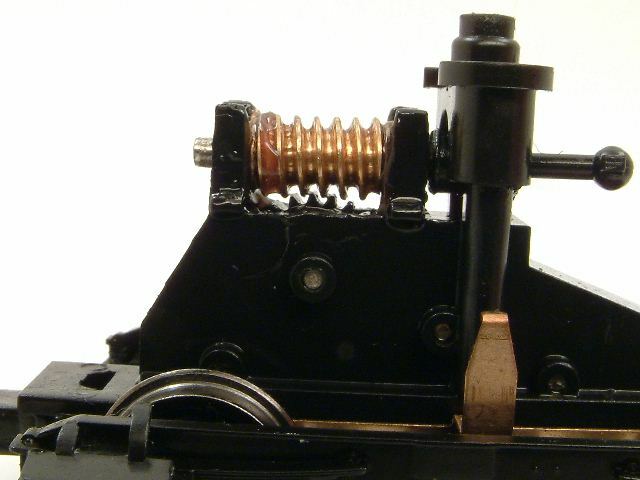 The overall reduction ratio of the Bachmann drive bogie is approx 13:1. The mesh between worm and gear on the unit as supplied is very poor. It's a shame that Bachmann felt the need for a mazak casting for the DMBS floor. 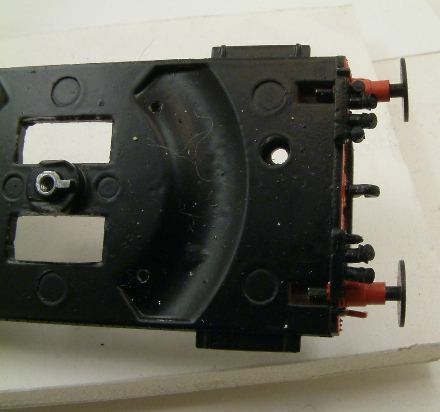 This is the non-driving end of the DMBS showing the dished cutout necessary to clear the wheel flanges. 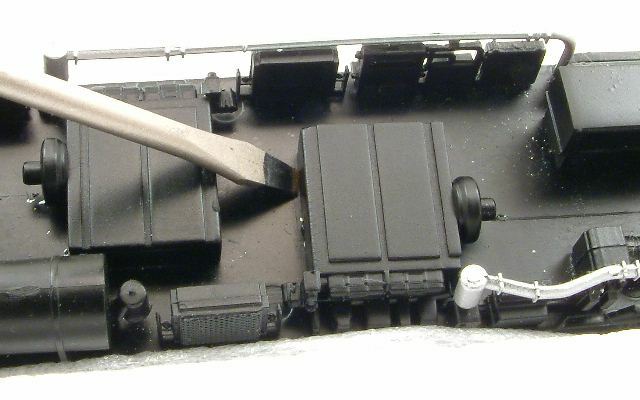 The plastic covers representing the prototype engines can be prised off with a screwdriver. 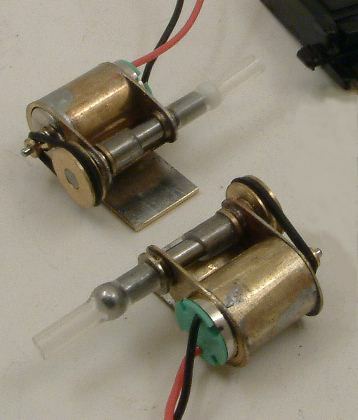 These 3.6:1 beltdrive reduction motor units use Nigel Lawton 6V 6mm diameter 10mm long micromotors, belts and pulleys, Bill Bedford etches and bearings, and constant velocity couplings. The motors will be wired in series, and each one will drive onto a Bill Bedford 14:1 gearbox on the inner axle of each bogie on the DMBS. The first block on the mazak chassis has been milled off, and the new motor assembly is being tried in place. The motor assembly is mounted off centre so that the original plastic engine mouldings can cover them as much as possible.